Map It! Okinawa: "Kanumou Well (Awase)"
If you recall in an earlier posting, we talked about 'Old Awase' at one time being a deserted island many, many years ago (See Meinu Utaki). As more and more people moved here in Awase the need for more water became apparent. The villagers dug and built a well. "It became a common place for the villagers and a symbol of prosperity" (translation from the headstone). The well has gone through many makeovers over the years. What you see above is the current structure restored in 1983. If you noticed to the right of the picture, there is a place of prayer and worship to give thanks. The name of this well is called 'Kanumou'. On the inscription, it is written in Katakana, which suggest it is a Hogen word (Okinawan native language). I do not know exactly what it means. Part of the inscription suggests that it may mean 'greenery' (see below). It could not be verified at this point with any accuracy. Hogen dialect can vary as well from village to village. Right now, it is on my list of things to find out and will update this post accordingly. Below is a translation that outlines significant events related to this well. In 1906, there was major work done to this well. Layers of rocks were placed at the bottom and surrounded with greenery, 'Kanumou'. In 1923, the top portion of the well was built with concrete and a roof of elegant structure. In 1948, there was an accident. A stack of U.S. Military drums containing coal tar caught fire near the well and burned everything down. 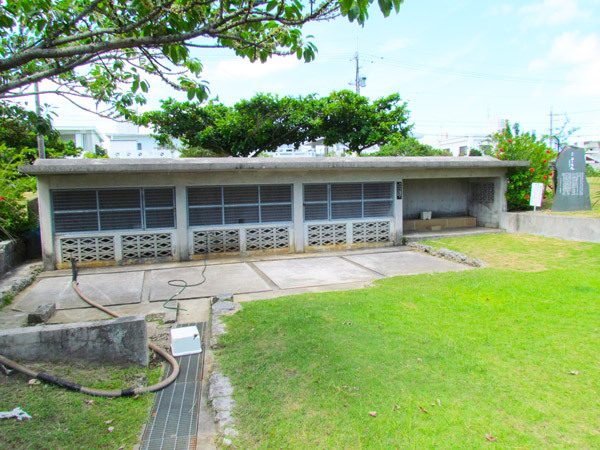 In 1983, the 'Kanumou Well', still remaining on its original soil, was restored by the Awase Land Adjustment Committee. How to get there. The Well is not difficult to get to. The Kanumou Well is right in front of a U.S. Military telecommunication installation. It is a straight shot from the Highway 85 intersection. It is basically on the same road along the Awase Shrine and the Meinu Utaki. (Reader's note: Icons of nearby areas will not be visible on the above map. This is because Google Maps starts a new complete Map Page when a certain number of Icons been marked. Don't worry the other icons are still there. To see the other places of interest on the map, click the 'View Map It! Okinawa in a large Map' link and scroll down at the bottom where you see the Previous and Next Link. I have provided feedback to Google that they should show everything on the map. Hopefully they will listen). 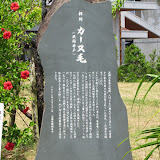 Other places of interest nearby: The Awase Shrine, The Meinu Utaki, The Awase War Memorial, The God of Fire Utaki, Ubugaa.